Maybe I'm alone thinking this, but I'm beyond bored with all the blah hipster looking baby/kids clothes most US retail stores are all showing these days. They all look drab and same-y and are crazy high priced for what you get. Why would I want my 6 month old to dress the same as a 28yr old barista from Portland?!? A baby should look like a baby! 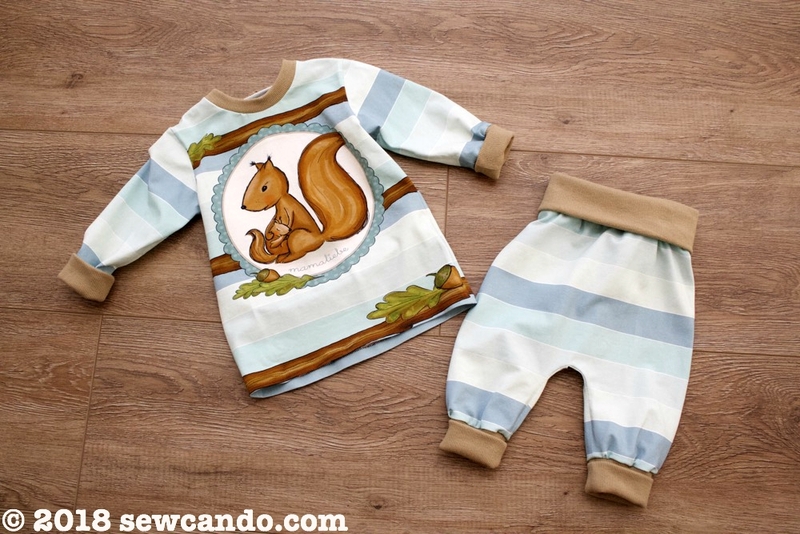 Clothes for littles should be cute & fun! 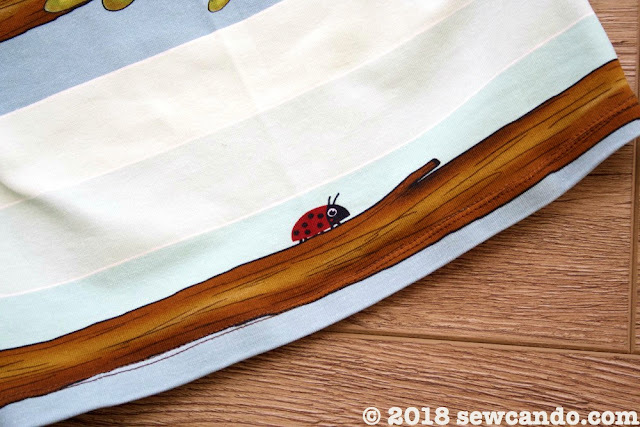 Apart from shopping exclusively at Carter's or going broke at Boden or Hanna Andersson (who is drabbing out too IMO), the only other option is to find better fabrics and make my own stuff, so here I am. 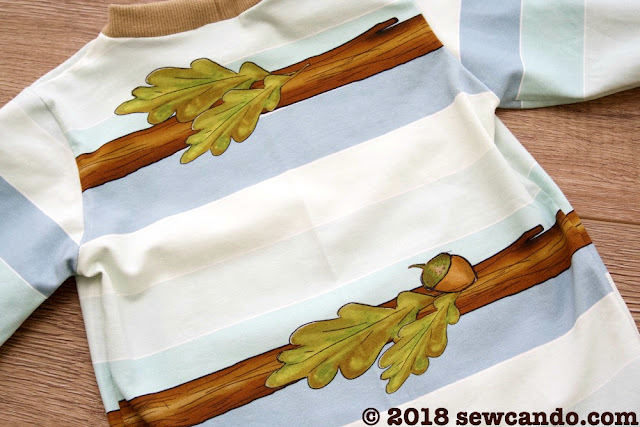 I bought this fabric as a special order last fall from Frollein S and whipped up some comfy fun separates for my little guy. It's a euro knit from Mamaliebchen called Mia & Max. 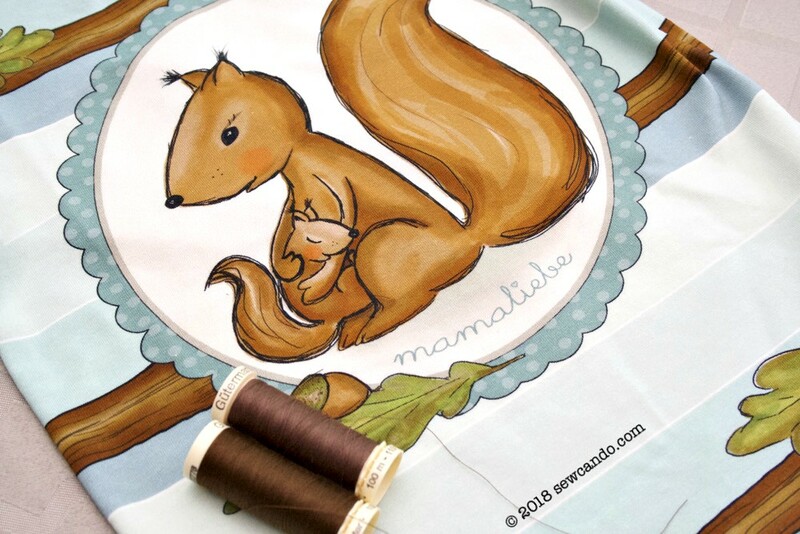 I just loved the mama & baby squirrel cameo on it. It was bit too big to use when he was a newborn, but now it's ideally sized. Even when it comes to fabric options, there are SO many more cute prints available from European fabric manufacturers! I bought a panel & a fat half of the coordinating stripe in both the mint & rose color ways. 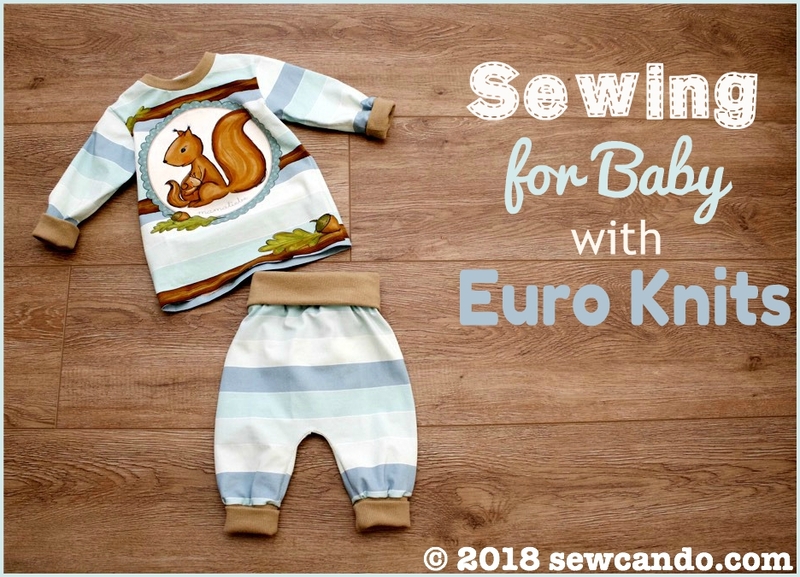 Euro knits tends to be really wide so small cuts go a long way, which makes them more economical (as full yards can get pricey!). The panel was 18 inches high by 60 inches wide, so the fat half of the stripe coordinate was a generous 30 inches wide by 36 inches high. Enough for several items for a baby and at least a nice long sleeved top for a big kid. 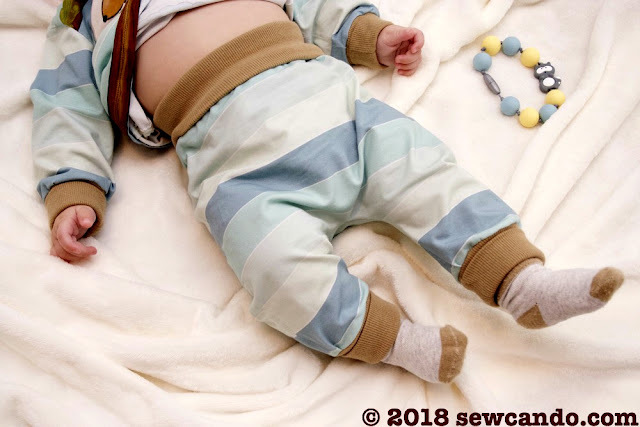 I decided to make a sweet pull-on top & pants outfit for my little guy. The top pattern was the Pinaatti T-shirt from the 1/2010 issue of Ottobre Design. I did the 74cm size for my 6 month old. It's a roomy fit shirt with fold over cuffs, so it'll last for a good while. The harem pants are a pattern I made from studying a pair of baby pants I'd bought before my little guy was born. 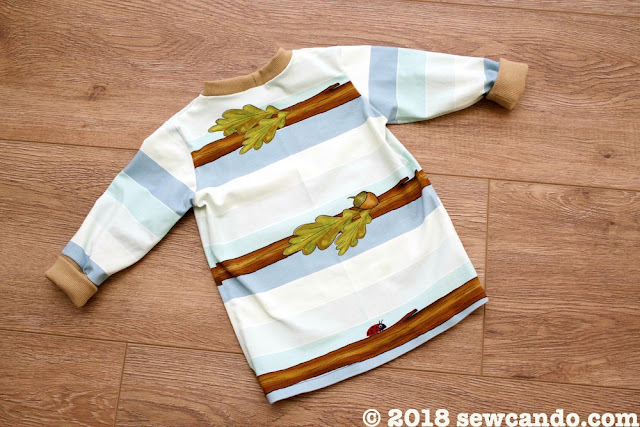 I've used this pattern many times already and it's a super quick sew that gives lots of room so it fits for ages. A few slightly smaller pairs I've already made have lasted from birth to now as far as fit. I might make it into a pdf pattern and offer it in my shop since it's beginner friendly and doesn't require a serger. 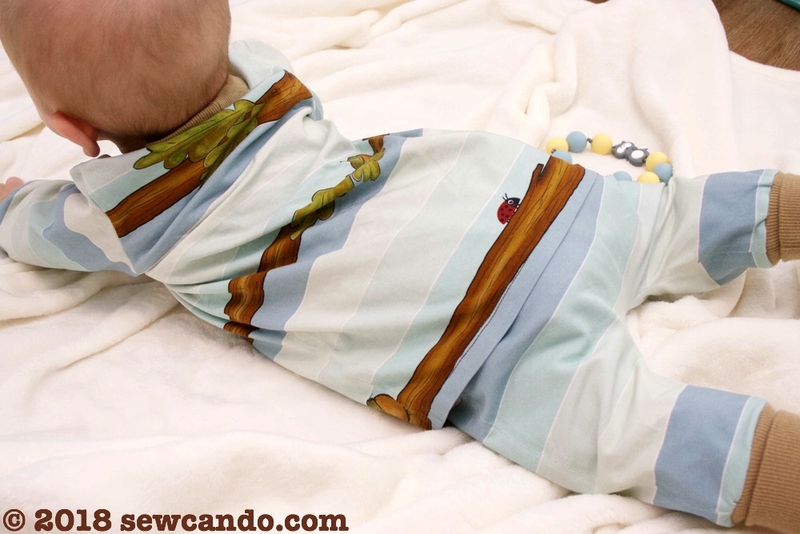 Using rib knit for the fold-over waistband and cuffs gives an easy pull-on style that also grows with baby. I'll just unfold the waist and cuffs as he sprouts more inches. I slightly enlarged my original design, so these should fit for another 6 months+. Babies grow so fast and free time is so scarce for me these days that I feel that any baby clothes I make have to be able to get more than a measly 2-3 months wear. This little outfit should last for at least double that, so I'm thrilled. I'm definitely going to use both patterns again to make more fashion goodies. 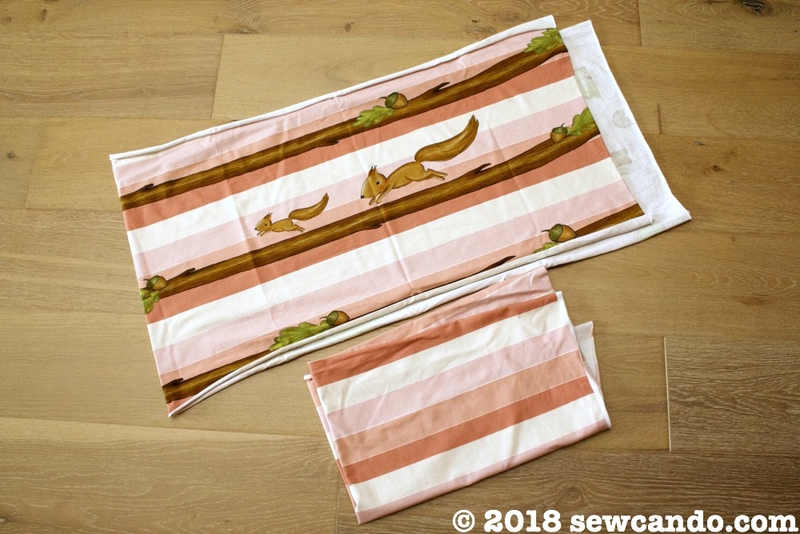 And since the fabric cuts were so nice & wide, I've still got plenty of the mint fabric left over for another little top or a few accessories like hat & bib or burp cloth. 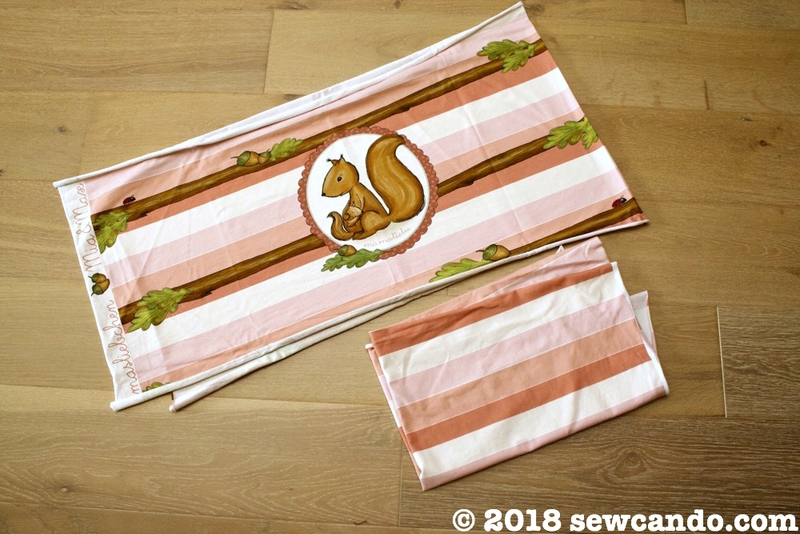 I'll have to do a bit of blocking to make a matching rose top for my 9yr old with the same amount of fabric (since an 18in high panel is a little short for her) but I'm confident it'll work out well....once I get some extra time that is! What a clever idea, the shirt is very cute ! !